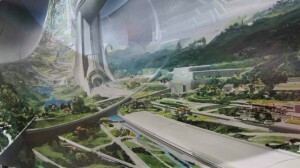 Inherent to the future of Earth presented in Elysium are some bold technological advancements, some new, some tropes of cinematic science fiction. Much of the story revolves around (no pun intended) an orbiting paradise on a monstrously-scaled satellite complete with its own gravity. I had the amazing opportunity to speak to none other than Mark Uhran about the real-life scientific grounding of what we see in Elysium, and as the recently-retired Director of the International Space Station —an impress business card if I’ve ever imagined one– he’s exactly the right guy to ask. With three decades of work put into the ISS and an illustrious overall career at NASA, Mr. Uhran knows his stuff and had some fascinating things to say about the science of Elysium, and how some of it may well be developing faster than you think! We also chat a bit about the role of pop culture and scifi in shaping the next generation of science enthusiasts, so check it out below and share it around your various streams and books and feeds! 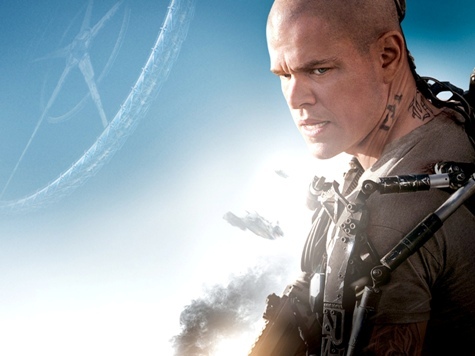 And to check out all of this hypothetical technology yourself, find your way to an IMAX theatre showing Elysium beginning today! Renn Brown: Elysium‘s concept is pretty straightforward in terms of taking place in a future with fully colonized satellites So could we start off with a sort of general update on where we are, in terms of progressing towards any such future? Mr. Uhran: Sure. So, I mean I spent twenty-eight years working on the International Space Station. Twenty-two of them at NASA Headquarters. 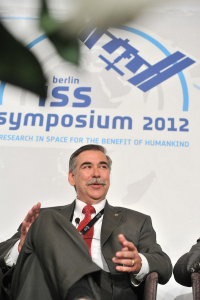 And then I retired as the Director of the International Space Station last summer. And I can tell you beyond a doubt that, you know, the International Space Station – the one that we have in orbit right now with six people onboard is a very robust and reliable system. So, you could equate that to the model T –so to speak– of space stations. There was the Russian MIR and of course there was the US Skylab back in the ’70s. So, it’s not like it’s the first ever space station, but it’s three times the size and has incredible performance compared to the prior space stations. So, the question is: well, given that level of performance today, you know, what could happen in 150 or 300 years? And there’s little doubt in my mind that human kind, provided we don’t sort of drive ourselves into extinction, can provide those scale of satellites within this millennium. Renn Brown: That’s quicker than I might have thought. Mr. Uhran: There’s basically two challenges. Two, big-step changes that would have to occur to get the something of a scale of Elysium. I mean, today, we use chemical compulsion to lift everything from the ground into space. There’s a space shuttle and all the rockets that everybody in the world uses. 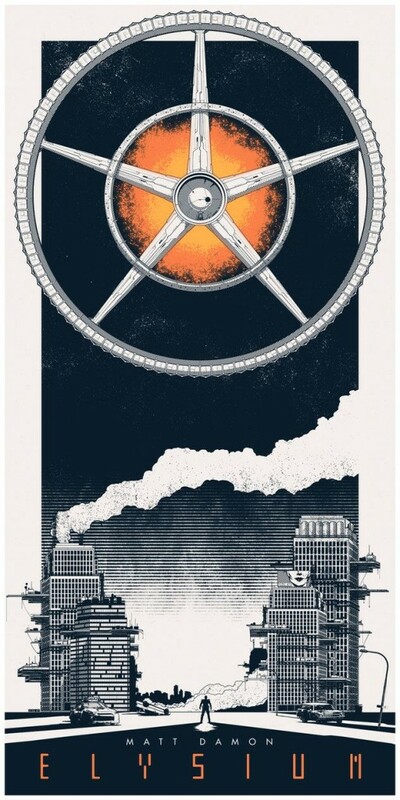 All the chemical rockets and you combust the chemicals, and it lifts mass up into space. Well, obviously you’d need a much more capable compulsion system to lift anything the size of Elysium. And even Elysium – they would build in pieces. They wouldn’t lift it all at once. But I believe that, you know, with nuclear fusion and technologies like that on the horizon, there’s no reason we couldn’t see fusion energy used for rocket compulsion in coming centuries. Renn Brown: I think definitely one of the interesting things, at least in terms of the spectacle of Elysium, by the looks of the trailers, is the scale of what Mr. Blomkamp has envisioned for the future of these kinds of environments. So, do you feel like it is feasible to create, or that we may be working with satellites and things on that kind of scale with the resources that we have on this planet, or are we going to have to get into asteroid mining and things like that before we could ever get to that level? Mr. Uhran: Well, so there’s the choice. You either bring it up from the ground, where you go off and you recover asteroids, or you mine it on the moon. It could go in either direction, provided that you have the propulsion technology. You need the next generation propulsion technology. And then, whether you life it out of Earth’s gravity well or you, you know, fly out and retrieve it or lift it out of the moon’s gravity, well, it becomes an economic trade. But you know, I think it’s certainly possible provided you get the new form of propulsion. I mean without next generation propulsion, you’re just not going to move that much mass around. 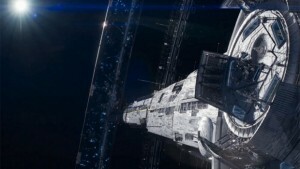 Renn Brown: This is true of really any science fiction film that deals with space, but I think one of the tropes that seem so far off is the idea of any kind of artificial gravity. Is there anything on the horizon that suggests that might be a force that we can, in some way, conquer or recreate on a satellite like this? Mr. Uhran: Okay. So, there are basically two paths to solve that problem. One of them is to rotate the structure, like they do on Elysium, to create an artificial gravity. That’s a pretty expensive and complex step. So, what NASA is doing today is we’re trying to avoid having to create artificial gravity and, instead, trying to determine if we can create an environment that humans can adapt to and survive in microgravity without physical problems, or permanent conditions, or anything like that. So the question hasn’t been answered yet. I mean we could fail. We could find out that, no, we’re just going to have to break down and create artificial gravity. On the space station, you may already be aware; we have some physiological issues with bone deterioration and muscle deterioration and so on. Mr. Uhran: So, the crews exercise a minimum of two hours a day in order to prevent that kind of deterioration. And it seems to be effective, but, you know, these astronauts are only up there for about six months at a time, and I think the world record is on the order of a year in orbit. But if you’re going to spend five or ten years living off the planet, you really have to have a clear answer of whether or not exercise will be sufficient or you have to go to a rotating structure. 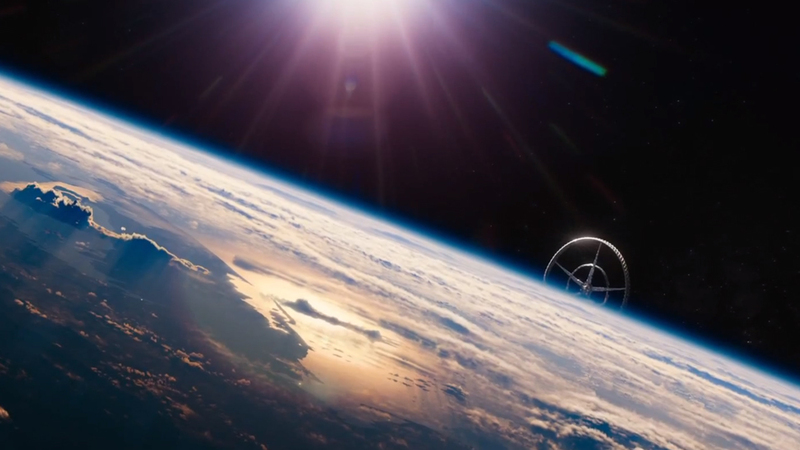 A rotating structure, like Elysium, is certainly not technically unachievable. That can be done. It’s just an added cost to do it. Renn Brown: So, I understand the ISS has anywhere from another seven to ten to twenty years left in its cycle. What do you think the next step is for that kind of program? Mr. Uhran: Well, if we’re going to — I mean NASA’s reason for being in the human space flight side of the program is it’s clearly human interplanetary space flights. So, the next step could either be to the moon or to an asteroid, or to mars. And of course there’s a lot of political debate about those three. I think their current policy position is they’re going to do an asteroid retrieval , although they’re certainly a large portion of that community that prefers to establish a lunar base. Those are all political decisions, and we just have to see how they play out. I would say that the long-standing model was a lunar colony. Renn Brown: More in general, tell me: how do you feel about film and TV and pop culture’s role in terms of science fiction and things like your Star Trek‘s and your Star Wars‘ and other pop culture sci-fi shows… What are your personal feelings on where they sit in terms of inspiring younger generations and what role they have in keeping people interested in science in a way that ultimately manifests in political and financial support to keep it going? Mr. Uhran: Well, I think we all know that the two things that kids like the most are dinosaurs and space. I used to say, “If I could just figure out how to grow dinosaurs down the space station, I’d have it licked.” Space is incredibly stimulating to young people and old people. I think we all have a desire to see the species move out into the cosmos. I mean Star Trek set the tempo for that and it just has never subsided. I think, if you recall back in, I guess it was, the 19th century, the Manifest Destiny Policy of the US Government to develop the Western United States, humans just seemed to have a natural inclination to want to move outward and develop their environment. Space stimulates it incredibly. Renn Brown: Absolutely. Is there any kind of pop culture or science fiction that inspired you personally when you were younger or at any point in your very long, illustrious career? Mr. Uhran: Well, I certainly grew up on science fiction. I mean Arthur City Clark and Robert Heinlein, and Isaac Asimov we’re my favorite authors. There’s no doubt about it. And then along came Star Trek, so I’m just part of that generation. Renn Brown: That’s great. How do you feel about contemporary scifi films? Mr. Uhran: I think they’re doing a good job. I mean Elysium is a fascinating film because it has basically two premises. The technical premise that you could establish a space station of that magnitude, and I believe you could sometime in this millennium. And then a social premise that defines that you could polarize between the haves and have not’s. And well, that’s certainly believable, because we already see it today. Renn Brown: Thank you so much for your time! It’s a honor to get to speak with you. It’s very refreshing to speak with someone with your kind of perspective on films like this. Mr. Uhran: Sure enough. It’s always fun talking about space.